I was compensated by Nielsen-Massey Vanillas for my time in developing this recipe and post. All opinions are my own. Thank you for supporting the brands we love that make The Daring Gourmet possible! But only three words are needed to describe the pure bliss that accompanies each bite: Chocolate. Caramel. Pecans. 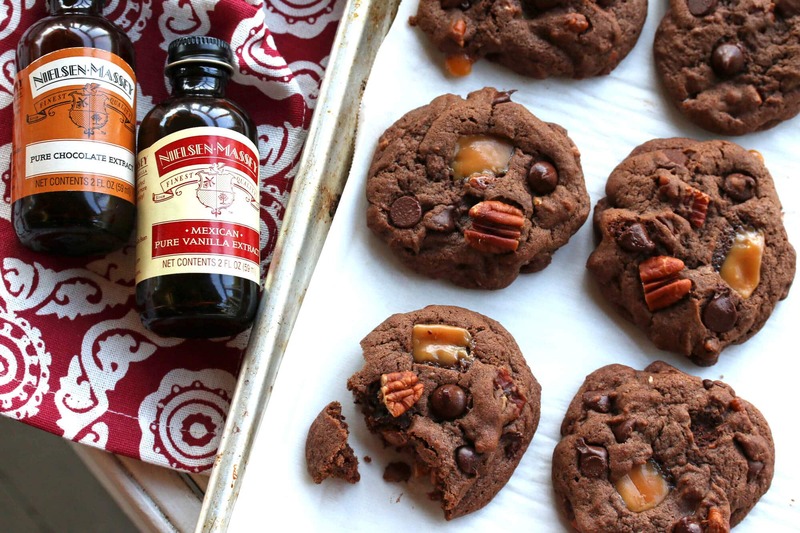 What happens when your favorite chocolate candy meets a cookie? 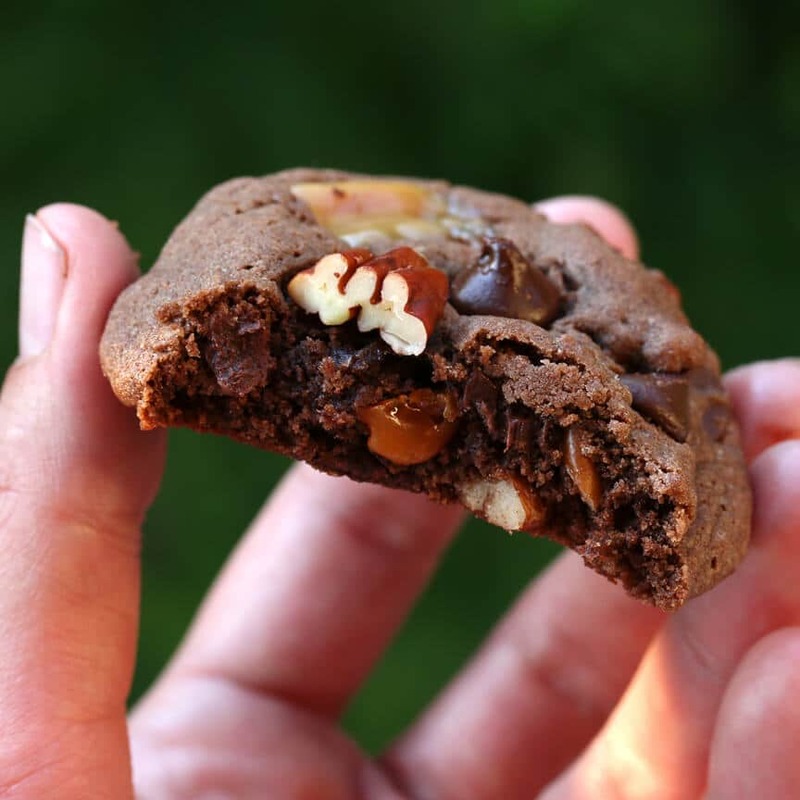 They get married and produce a winning new generation: Chocolate Turtle Cookies! These cookies are spiked with the delicately intoxicating flavor of Mexican cinnamon, the warm spiciness of Mexican vanilla beans and the subtle heat of ground red chilies while the chocolate flavor is accentuated by some quality chocolate extract. Pure chocolate extract is crafted from top quality cocoa beans and is the ultimate secret to punching up the chocolate flavor in any chocolate baked goods. 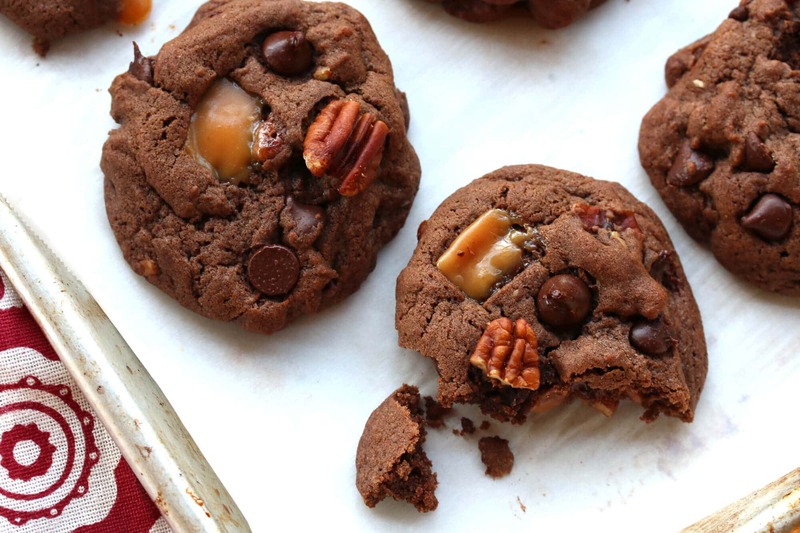 Combine those flavors with rich chocolate, toasted pecans and oozing chewy caramel and you have these deliciously unforgettable Mexican Chocolate Caramel Pecan Cookies! No Summer barbecue or picnic is complete without dessert and for any outdoor eating occasion mess-less finger foods are always welcome. 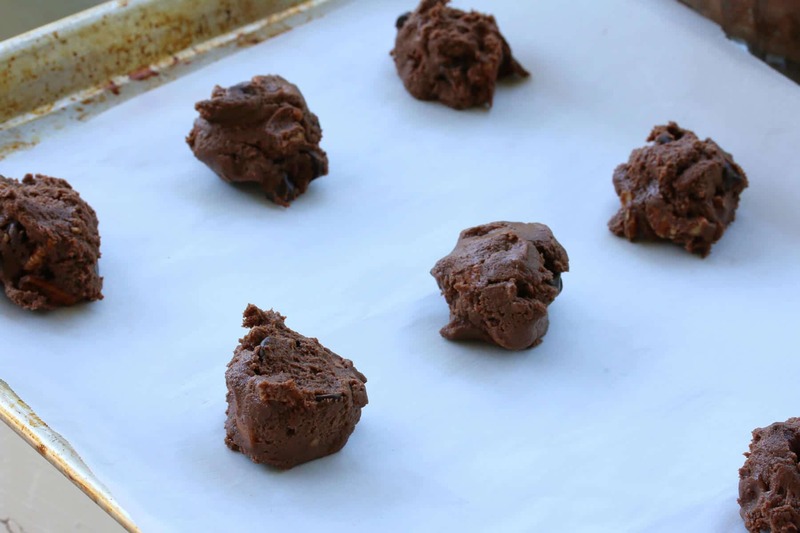 A fuss-free sweet treat, the cookie dough can be made way advance so all you have to do is pop them in the oven for 10 minutes just before serving. For some heightened eating pleasure set out a tub of vanilla ice cream with some bowls and your guests can enjoy the two in combination – irresistible! Ready to bake some cookies? …and the Pure Chocolate Extract and beat to combine. 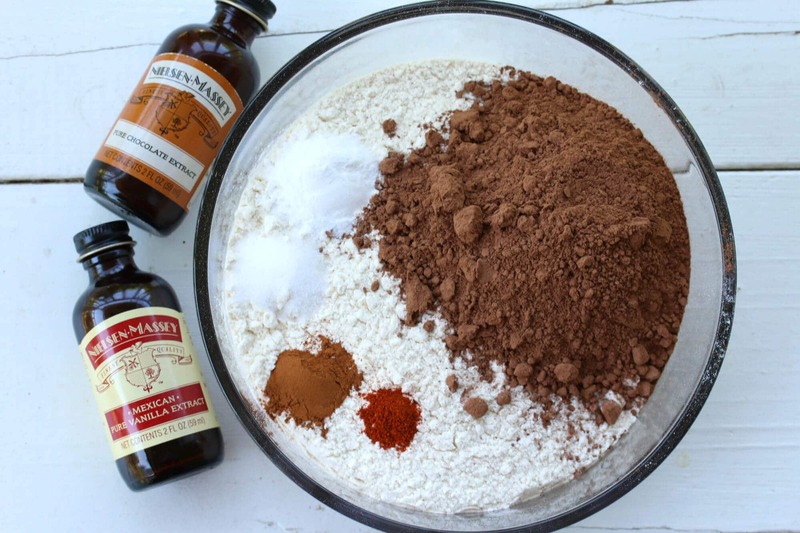 Combine the flour, cocoa powder, baking soda, salt, cinnamon and chili. 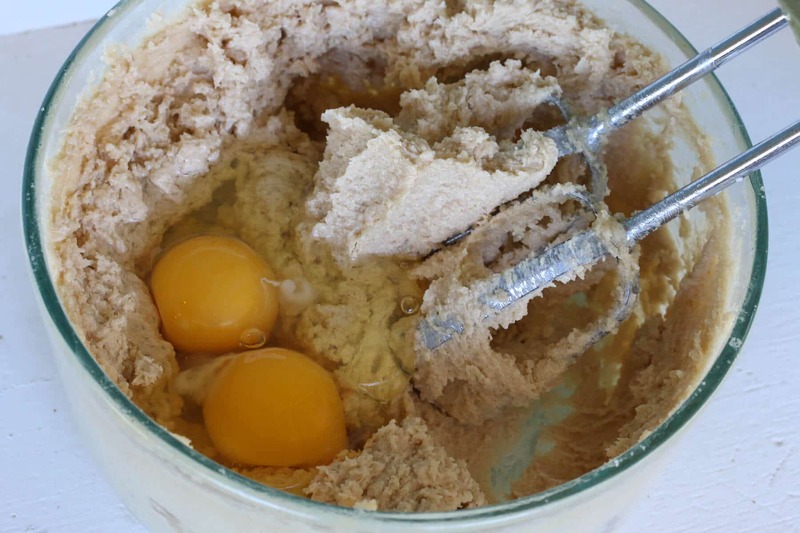 Add the flour mixture to the wet mixture in thirds, beating between additions just until combined. 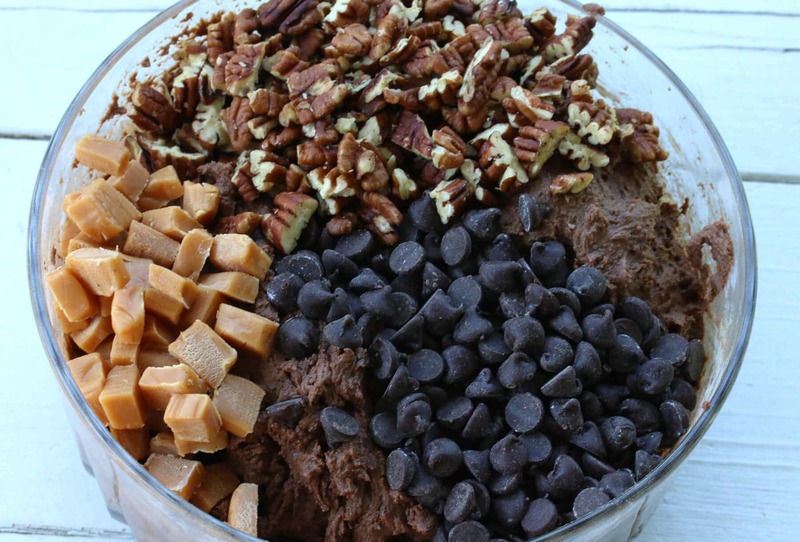 Add the chopped pecans, caramel and chocolate chips and stir until combined. 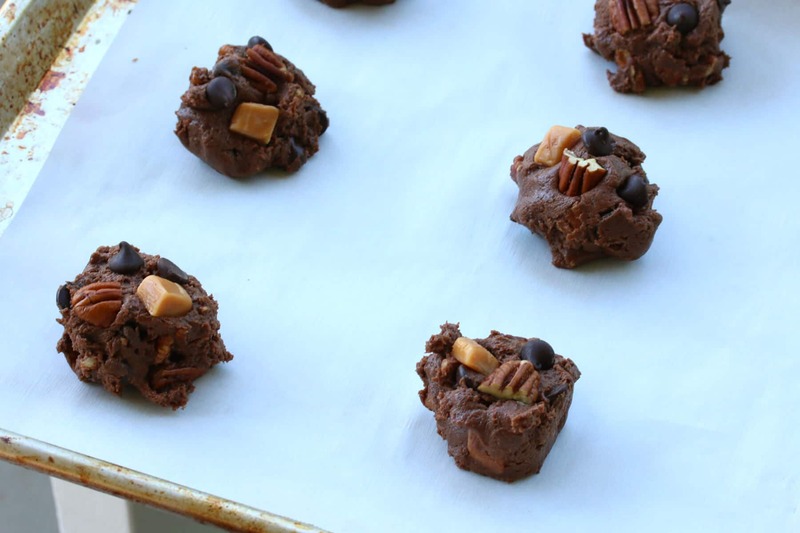 Place a rounded spoonful of cookie dough on a lined cookie sheet. 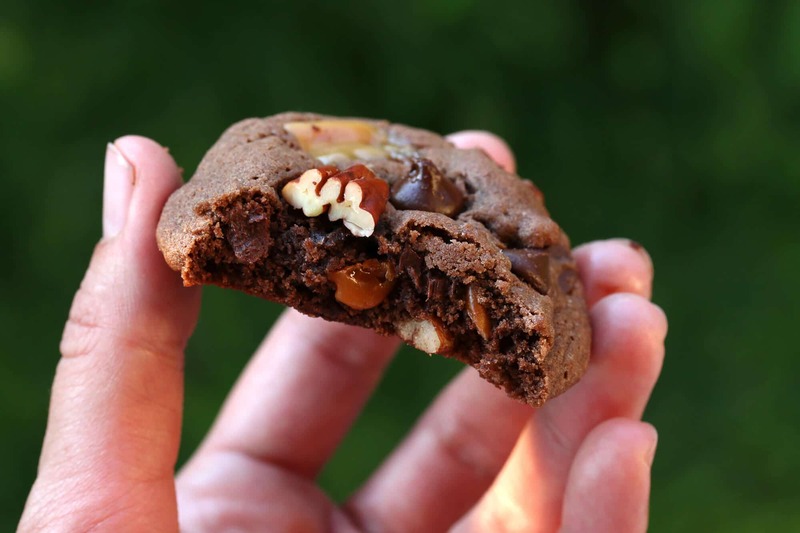 To make the cookies look extra pretty, have some extra chopped pecans, caramels and chocolate chips on hand to place on the top of the cookies before you bake them. 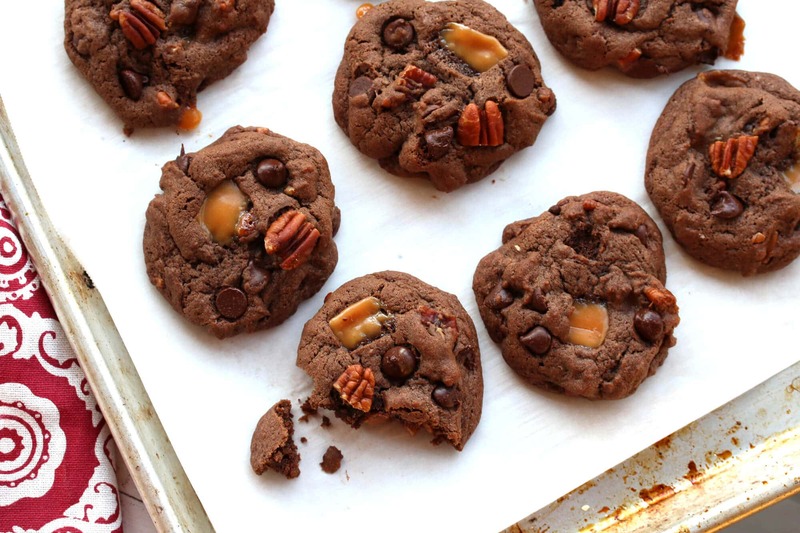 Place a piece of pecan, caramel and a couple of chocolate chips on the unbaked cookies. Bake the cookies in a preheated oven at 350 degrees F for 8-10 minutes. Let them cool on the rack for 2-3 minutes before removing them to a wire rack. 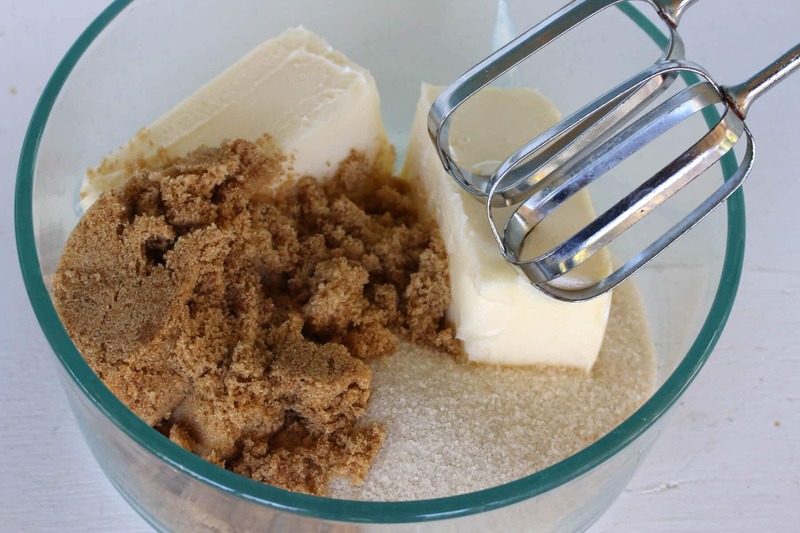 Cream the butter and sugar in a large mixing bowl. Add the eggs and beat until combined. Add the vanilla and chocolate extracts and beat to combine. 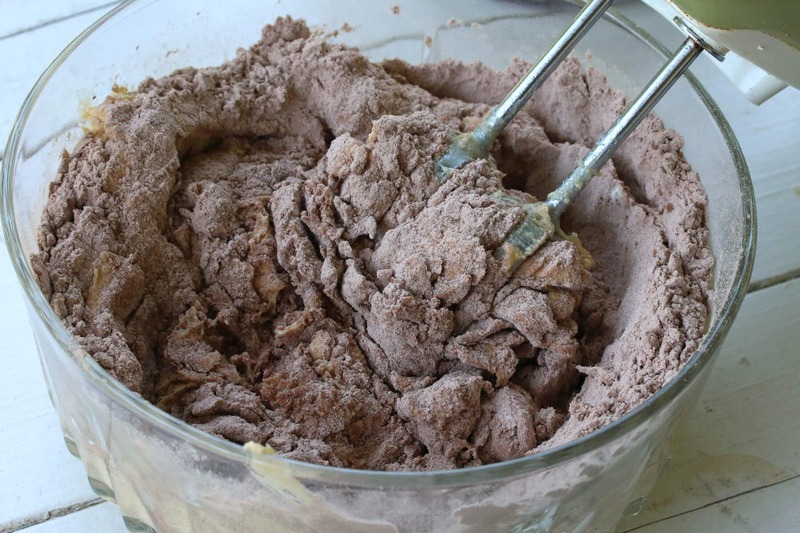 In a separate bowl combine the flour, cocoa powder, baking powder, cinnamon and cayenne. Beat the dry mixture into the wet mixture in three parts, beating after each addition just until combined. 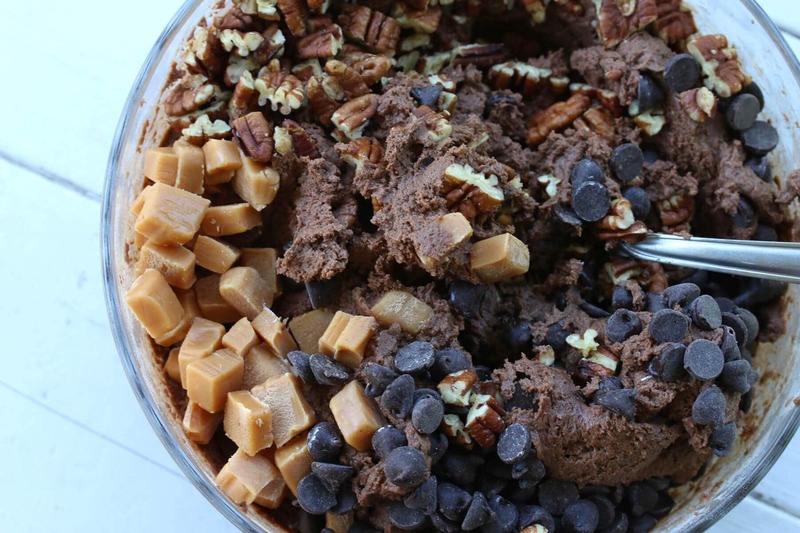 Stir in the chocolate chips, toasted pecans and caramels. Place rounded spoonfuls of cookie dough onto a lined cookie sheet. 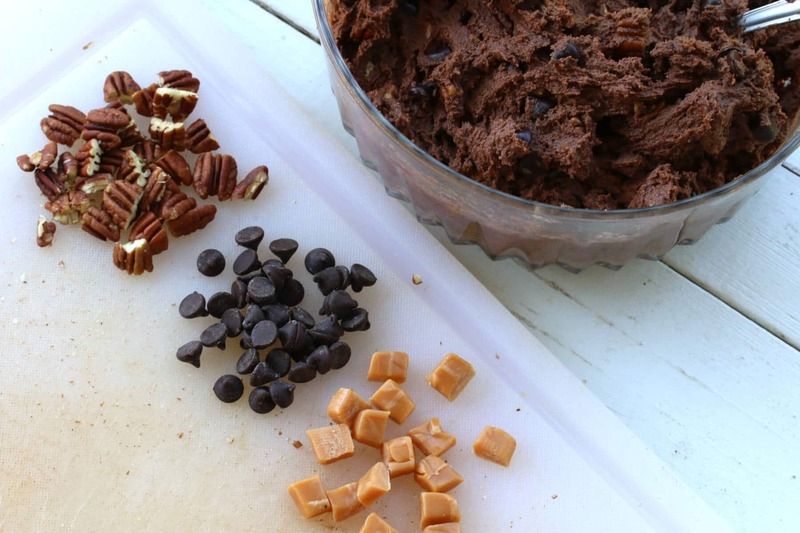 Place a pecan, caramel and a couple of chocolate chips on each mound. Bake for 8-10 minutes. 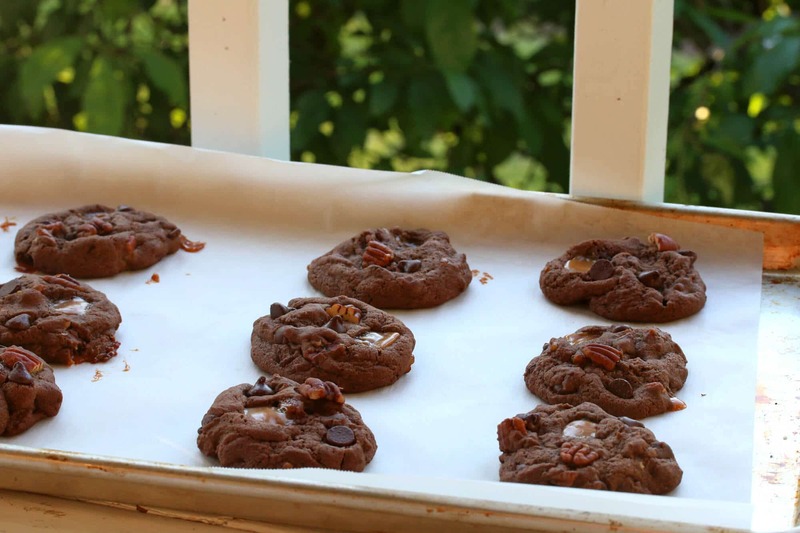 Let the cookies cool on the cookie sheet for 2-3 minutes before transferring to a wire rack. I’ve never met a chocolate cookie I didn’t like! Beautiful step-by-step photos. I’ve been trying out different extracts lately and I’ll have to see if I can find this brand locally somewhere. Thank you! That chocolate extract is amazing! I’ve got 2 bottles in my pantry! These cookies, oh my word. I love Mexican Chocolate so I know I’ve got to make these! This is one fantastic cookie, you have developed such wonderful flavors here. These cookies have all my favorites in them. I am intrigued by the chocolate extract. Goodness, these look heavenly! My favorite candy in cookie form – love it! I’ll bet that chocolate extract is a wonderful addition, I’ll have to get a bottle of that!! 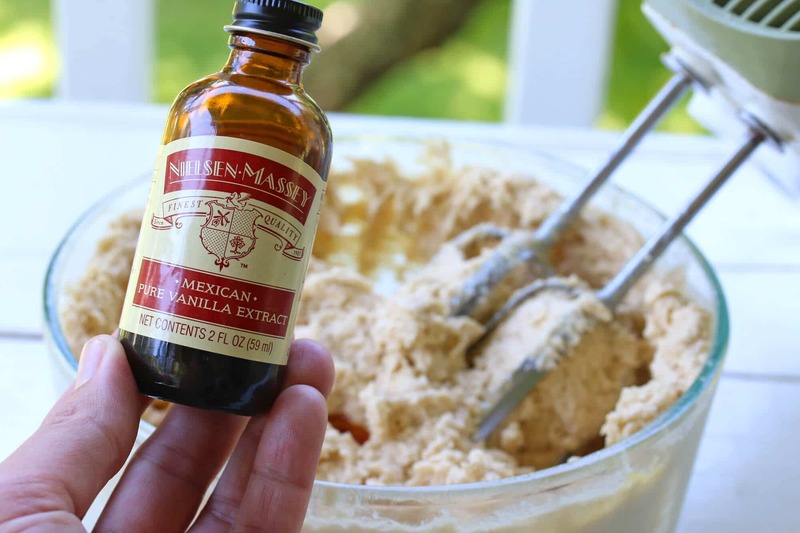 I’m a huge fan of Nielsen-Massey vanilla – their extract and paste are the only kind I’ll use! I definitely have to try those other extracts. And these cookies look amazing, LOVE the flavors going on here! Oh boy. I really really want these! My husband and kids love chocolate cookies! These would be a great treat for them! LOVE Nielsen-Massey vanilla and LOVE the looks of these cookies! Brilliant idea! I love the idea of chocolate extract! I’m soooooooo ready to bake some cookies!!! YUM. These flavors are so decadent and delish. WHOA! These look incredible! 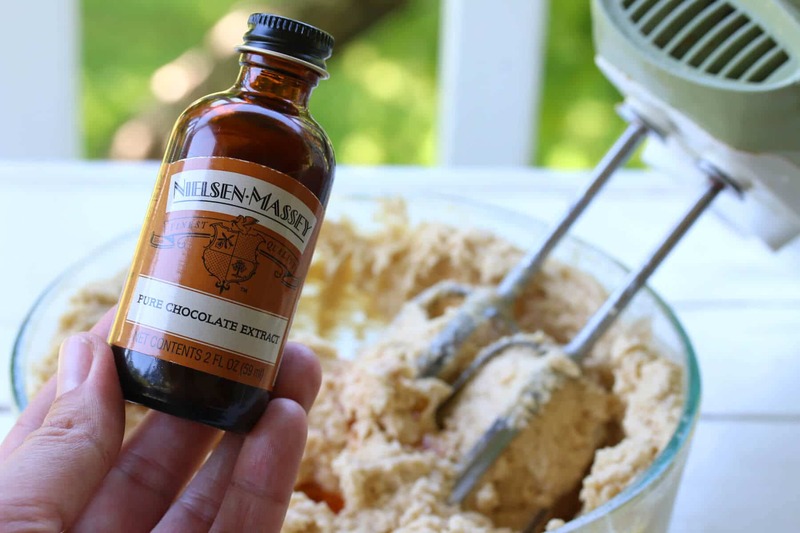 I use Nielsen-Massey vanilla all the time! I often buy this brand of vanilla extract. I like that it comes in larger bottles and that it’s made with quality vanilla. Great cookie recipe, Kimberly! These cookies look so thick and delicious!! What a great flavor! My family loves cookies! These would be a total hit in our house! Everything about these cookies sounds amazing! I just want to eat that big bowl of dough! You really can’t beat the flavor of pure vanilla extract, imitation is not the same at all! These look fantastic! 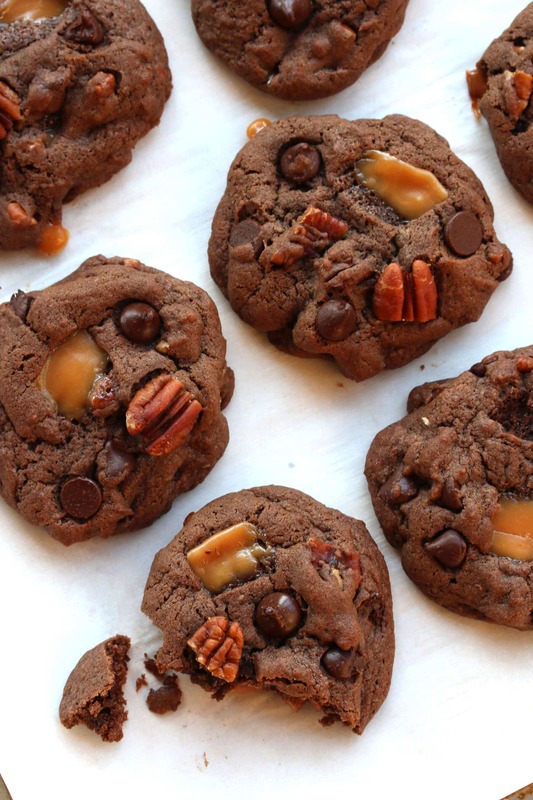 These cookies look amazing – chocolate, caramel and pecan is the best combination! 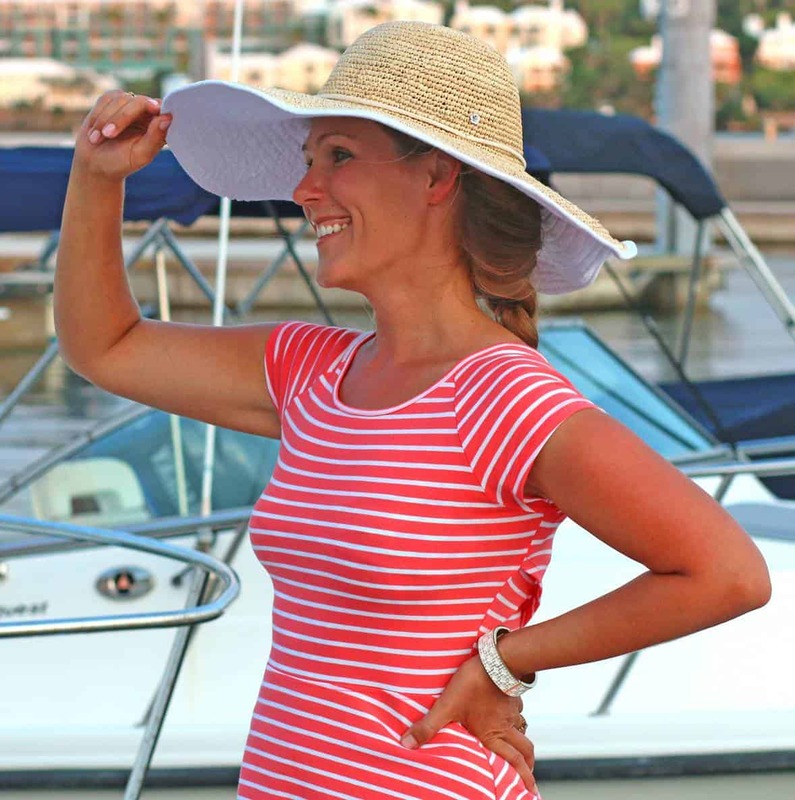 The turtle combination is one of my favorites! Even as a teenager, I used to buy myself chocolate turtles! Those cookies look pretty amazing. I need to find that vanilla. Beautiful recipe! I love turtle candies so I know I would love these! Wow, Amelie, you are QUICK! :) So glad you enjoyed these and I really appreciate the feedback, thanks!! I love their vanilla, but I MUCHO LOVE your cookies! :-D Seriously, SO GOOD! I’m not ready to make some…but I’m past ready to eat some. Wow, they look beyond amazing with all of those amazing mix-ins. And oh my gosh, I’ve never seen chocolate extract, I have to try that! When you say caramels, what exactly do you mean? Presumably not toffee as that’s too hard. Like a fudge? Do you have a make you can name? Something maybe getting lost in translation to to the UK candy buyer! Hi Chris, I’m trying to think what might be the equivalent in the UK (I lived there 7 years) but am drawing blank. No, it’s not toffee (though you can certainly use toffee – it will just be crunchy instead of chewy). What you’ll need to look for is some kind of chewy caramel candy that you can chop up. If you can’t find anything like that you may need to just go with the toffee (nothing wrong with a little crunch, right?). I’m a Mexican 10 year old and when I made these, DELISH!